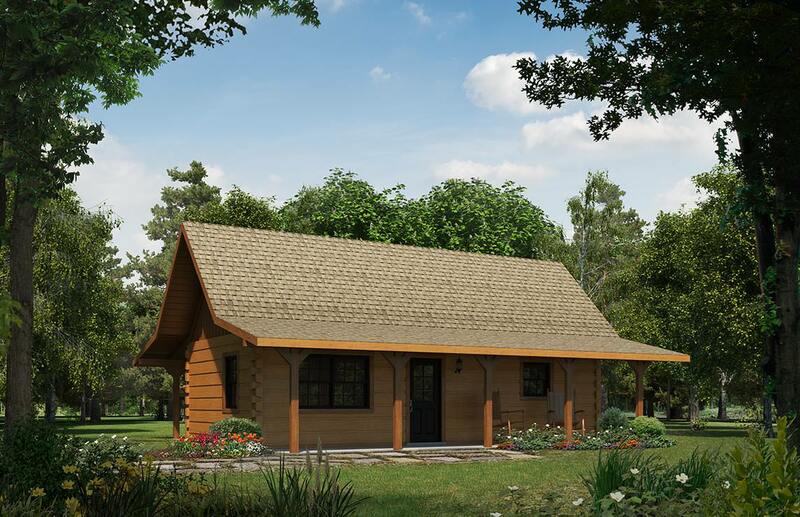 Satterwhite Log Home's Walnut Creek floor plan, at 512 sq ft on the main level, surpasses the tiny house (400 sq ft) classification by a mere 112 sq ft, but packs an appealing open floor plan connecting kitchen and dining room with a good size 16' x 16' living room. Add to this a bonus 256 sq ft in the finished, ladder accessible loft space, for a total heated & cooled living space of 768 sq ft, and a generous 384 sq ft of covered porches for useful outdoor space, and the Walnut Creek shapes up to be an ideal flexible log cabin plan for many purposes. The family room can easily be converted into a multi-purpose space such as an art or craft studio, or with the addition of a Murphy bed, fulltime or occasional use as a home. The Walnut Creek is also an excellent choice as a guest cottage, or rental cabin in a resort, retreat, or bed and breakfast setting.